Running aground is a common situation for experienced and novice boaters alike, and so having an array of techniques on hand to safely re-float a grounded craft is a very handy maritime skill. 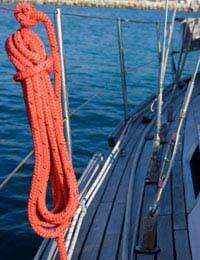 Besides being a major irritation, running aground can cause significant boat and equipment damage if dealt with badly. Once the realisation that the boat has run aground dawns the immediate reaction should be to stop and put the engine into reverse. If it is a sailboat then the sheets should be slipped to kill the forward motion. The only place where a boater can be confident there is deep water is directly behind them. A sharp reverse motion is often enough to avoid grounding. How serious the grounding can be assessed by the associated sounds and movements. For instance if the boat motor struggled, whilst the craft itself bumped a couple of times and then slowly slid to a halt, then this is a archetype minor grounding. The vessel will be stuck but the bottom will be soft and relatively easy to escape from. A worrying sign is when a vessel is stuck following a sudden halt. A bad situation is when a boat suddenly stops and then slumps down over one side of the bottom. If the grounding was accompanied by an almighty jolt and a symphony of pained crunching and grinding then the boat has likely struck rock. This is a worst-case scenario. Depending on the speed of the collision and the hardiness of the boat, a rock collision could potentially result in damage to the rudder, shaft or even the hull. Once a boat is freed from a hard grounding it is important to check it over to make sure no serious damage has been inflicted before heading for deeper waters. For example, opening the bilge will help assess whether there is any water coming in. It is better to be grounded than sunk. Tides can have an influential effect on a grounded vessel and are therefore worth considering in tidal areas. A boat grounded in a soft surface during low tide will have little to worry about and can relax in the knowledge that the tide will soon return and float it off. Conversely if a boat is grounded in high tide then efforts should be made to free it in case the tide slips away and leaves the vessel stranded. If the boat does become grounded in a lowering tide then an anchor should be thrown out in the direction of deep water. The line should be kept tense whilst the tide rises. This will often help to pull the boat free. Just as a rise in tide can relieve the weight and pressure of the boat keeping it stuck in the ground, the manual relief of downward pressure can also help free the vessel. For instance, if the crew are able to get out of the boat then the reduction in weight is often enough to release the grounding. If leaving the boat is not an option then sometimes just moving passengers from the bow, often the deepest part of a boat, to the stern will have a positive effect. If the boat is caught in a potentially dangerous spot or at an inopportune moment, such as when a storm is brewing, or when the seas are getting too lively, and immediate action is a necessity, towing offers a good option. If a passing vessel cannot offer any towing assistance then a rescue service should be able to help out. Running aground is not always such a bad event and not always such an accident, boats with sturdy keels are often intentionally run onto the ground for bottom maintenance or cleaning. There are even twin-keel sailing boats that are designed expressly to be unfazed by an ebbing tide and rest sturdily on the bottom. Many harbours around the UK’s coastline are regularly left high and dry by the tides and so its residents need to be able to deal with grounding. The more delicate performance crafts, such as a mono-hull sailing vessel, should exercise the greatest caution, as their aerodynamic frames are not designed to cope with grounding.